Stem cell biologists have tried unsuccessfully for years to produce cells that will give rise to functional arteries and give physicians new options to combat cardiovascular disease, the world’s leading cause of death. Now, new techniques developed at the Morgridge Institute for Research in Madison, Wisconsin, and at the University of Wisconsin-Madison have produced, for the first time, functional arterial cells at both the quality and scale to be relevant for disease modeling and clinical application. Reporting in the July 10, 2017 issue of PNAS, scientists in the lab of stem cell pioneer Dr. James Thomson describe methods for generating and characterizing arterial endothelial cells — the cells that initiate artery development — that exhibit many of the specific functions required by the body. The PNAS article is titled “Functional Characterization of Human Pluripotent Stem Cell-Derived Arterial Endothelial Cells.” Further, these cells contributed both to new artery formation and improved survival rate of mice used in a model for myocardial infarction. Mice treated with this cell line had an 83 percent survival rate, compared to 33 percent for controls. “The cardiovascular diseases that kill people mostly affect the arteries, and no one has been able to make those kinds of cells efficiently before,” says Dr. Jue Zhang, a Morgridge assistant scientist and lead author. “The key finding here is a way to make arterial endothelial cells more functional and clinically useful.” The challenge is that generic endothelial cells are relatively easy to create, but they lack true arterial properties and thus have little clinical value, Dr. Zhang says. The research team applied two pioneering technologies to the project. First, they used single-cell RNA sequencing to identify the signaling pathways critical for arterial endothelial cell differentiation. They found about 40 genes of optimal relevance. Second, they used CRISPR-Cas9 gene editing technology that allowed them to create reporter cell lines to monitor arterial differentiation in real time. “With this technology, you can test the function of these candidate genes and measure what percentage of cells are generating into our target arterial cells,” says Dr. Zhang. 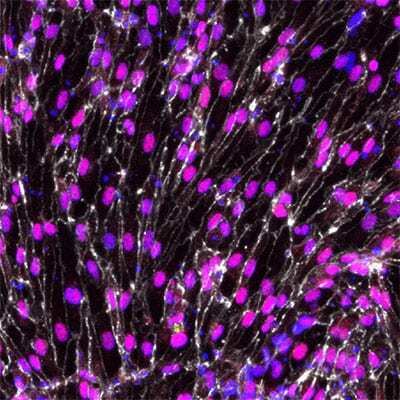 The research group developed a protocol around five key growth factors that make the strongest contributions to arterial cell development. They also identified some very common growth factors used in stem cell science, such as insulin, that surprisingly inhibit arterial endothelial cell differentiation. Dr. Thomson’s team, along with many UW-Madison collaborators, is in the first year of a seven-year project supported by the NIH on the feasibility of developing artery banks suitable for use in human transplantation. In many cases with vascular disease, patients lack suitable tissue from their own bodies for use in bypass surgeries. And growing arteries from an individual patient’s stem cells would be cost-prohibitive and take too long to be clinically useful. The challenge will be not only to produce the arteries, but find ways to ensure they are compatible and not rejected by patients. “Now that we have a method to create these cells, we hope to continue the effort using a more universal donor cell line,” says Dr. Zhang. The lab will focus on cells banked from a unique population of people who are genetically compatible donors for a majority of the population. This article is derived from a Morgridge Institute for Research release authored by Brian Mattmuller. BioQuick News would like to thank Madison resident Ron Lewis and his daughter-in-law Jade Lewis for the news tip on this exciting advance.